HOUGHTON – For the sixth year, Houghton High School biology students conducted research projects in the school forest and presented their results to their peers as part of the Lake Superior Stewardship Initiative. Teacher Lauri Davis, who is involved with the project along with biology teacher Alex Geborkoff, said the original goal was to accumulate data to track changes in the forest over time. She said the quality of the research has grown over the years. Student projects cover everything from water chemistry to the worms found in different parts of the forest. At the start of the year, students spend a day observing the school forest, then learn about how to design an experiment. Davis gives students a list of prior projects; students can choose from that list or design their own. Last year, she said, one group studied whether colored cups attracted insects differently. Over the winter, students learn how to write a research paper, assembling their preliminary results from the fall. Students told Davis the experience had taught them how to work in a group, how to do field work and the importance of the environment, particularly water quality. “They’ve learned things academically, but they’ve also learned things environmentally, which is sort of the point,” she said. Tenth-graders Kaylin Heikkila and Beth Campbell did a project testing water quality at the Isle Royale Pond. They tested eight times in the fall and six times in the spring. “It was really informational about how the water quality is in the area, and we learned a lot about how it affects wildlife and other things in Houghton,” Heikkila said. If they’d done it over again, Campbell said, they would have kept the same testing device, added more sites and added measurements such as temperature and turbidity. Davis has presented the program to other teachers in the U.S. and Canada. 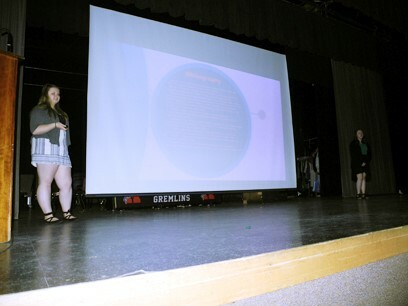 Photo caption: Houghton High School 10th-graders Beth Campbell, left, and Kaylin Heikkila give a presentation on research conducted at Houghton’s school forest Thursday.